And the winners are…. Here are the names the kids chose, from everyone’s suggestions! For the little ram lamb, Uncle Shane’s submission: Blackberry! For the little calico kitten, Rachel’s suggestion: Honey! And for the little black kitten, a spinoff inspired by the name Honey: Cocoa! Thanks, everyone, for taking the time to submit names – the kids had so much fun picking them out! We have a sick goat, and I am KICKING myself for not catching it sooner. Or, rather, for not DOING something about it sooner. I’m a big advocate of natural healthcare, letting the body heal itself and the “wait and see” approach. But sometimes you can wait too long, and sometimes medical intervention is necessary. I missed it with our little doeling… I waited and watched and her progression downward was so slow, it wasn’t until she was seriously ill that I finally intervened. Jon just called on his way home from the vet and she has pneumonia. She’s on antibiotics now and we’ll be doing lots of natural treatment along with it. I’m praying she’ll be okay. Not only is she a beautiful little doe with a sweet personality whom we love very much, but she’s also the future of our breeding stock and a very important part of all we’re doing here. This is a huge lesson for me… these animals depend on me to take care of them and I MUST be diligent about their care. There is no excuse. And speaking of first timer mistakes, I’m pretty sure our oldest goat, Kidzy, is pregnant and due any day now. This is a mistake because I have no idea when she was bred, or when to expect her to kid. Once upon a time, I was under the impression that I didn’t need to keep track of those things… one day, we’ll wake up to find a new kid or kids in the pasture, and that will be that. The more I read, however, the more I realize that complications during delivery are extremely common and it is critical to know the due dates of your does! I’m checking her ligaments daily (they’ll get soft just before she kids) but other than that there is just no way of knowing if she’s due this week or next month. Thankfully, she and both of her daughters have always had easy kiddings, so I’m praying that things will go smoothly this time and that I won’t need to intervene. Another lesson learned. what do you think? due any day now? The sheep and the goats are getting more used to each other now, and even graze together (well, closer together, anyway.) The sheep are still too afraid to go into the shelter with the goats, however, and with good reason – the goats are not fond of sharing. That means that the sheep don’t have any shade or protection from the rain, so I guess that will be our project for today! Second, I spoke with a woman (somewhat) close to us who has miniature beef cows and is interested in trading for some goats this Spring when we have kids! Some of our kids already have homes lined up, or are being saved for the Milk Enough project, but some of them WOULD be for sale, and we might be able to trade for beef cows! We’re thinking about miniatures for a few reasons. 3.) They dress out at about 250 pounds (as opposed to 500-600lbs for a standard cow) This would be good for two reasons… first, less freezer space needed, and we’d always have fresh meat, and second if we can keep three minis to one standard, we’ll actually get more meat, per acre, from the minis! 5.) We might be able to keep a bull on the property, if we wanted to, which means we could breed our own cows! From everything I’ve been reading, mini bulls are a lot more docile than their standard counterparts and (from a purely psychological standpoint) a lot less intimidating. It was really nice outside during the first part of the week, so they built a campfire. Between the cool air and the smell of the fire, it felt just like fall. It was a nice little reprieve in the otherwise hot, hot weather we’ve been having here! And although the temperatures outside have made our chores somewhat miserable, the more I read blogs written by people in other parts of the world, the more happy I am that we don’t live in an area where we have to worry about our goats getting frostbite or our sheep dying of heat stroke! 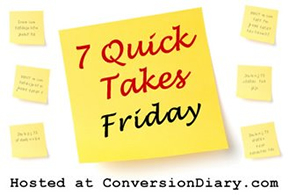 This entry was posted in Daybook, Frugal Fridays, PERSONAL, Seven Quick Takes. Bookmark the permalink.